For professionals who won’t settle for nothing but the best, Microsoft Visio 2016 Professional offers the best-in-class productivity suite for individuals who want to create high quality, professional-looking and versatile diagrams for depicting information. Now you can execute your diagrams, flow charts and graphs with tons of visually appealing themes, styles and templates to choose from. Microsoft Visio 2016 Professional suite has made diagrams simpler and more intuitive than ever. Do more with your diagrams when you upgrade to the Visio 2016 Professional edition. Visualizing complex information and data was never so easy before! Not the right Microsoft Visio product you were looking for? Check out our selection of additional Microsoft Visio Apps today. Microsoft Visio 2016 comes packed with the latest features and enhancements to get you started with professional quality and great looking results for your personal or professional productivity. With the latest version of Visio 2016, you can easily customize diagrams using the rich effects and themes and get completely beautiful and appealing designs in a matter of few minutes. Create Advanced Diagrams – Whether you are an individual or an enterprise, if you need to visualize your data with professional, advanced diagrams, Visio 2016 is the perfect tool for your productivity. Using the vast array of built-in templates, themes and styles, anyone can easily create, publish and share high quality and versatile diagrams to communicate better. Whether you wish to work alone or collaborate with others on a project, Visio 2016 lets you do more with diagrams. Features First – Visio 2016 enables you to make the most of Microsoft’s rich set of features to help you create simple, intuitive and visually appealing diagrams. Be it stencils, charts, network diagrams or shapes of different types, you can easily create easy-to-understand diagrams. Add to it the feature of team collaboration through SharePoint and you have the right tool to collaborate with your team and prevent information leakage with Information Rights Management. Easy to Use – Whether you are a beginner, an intermediate or an advanced user, Visio 2016 Professional edition lets you start things with a host of starter diagrams, text styles and shapes to let you start diagramming immediately. With versatile effects and a seamless, easy to use software you can now design and diagram better with few clicks only. The entire journey from ideation to creation is now much more simple and seamless with this upgrade. More Connectivity – In earlier versions, Microsoft Visio allowed you to export and connect your diagrams in few steps. With the Visio 2016 Professional, you can now connect your diagrams with Excel in one simple click. Now swap your data graphics more easily with Visio 2016 and experience the power and speed of one-step data connectivity. Work Together – Professionals rely on like-minded professionals and Microsoft understands the importance of a true team software that elevates the overall productivity of an organization. Visio 2016 Professional allows you to add comments and shape a diagram from any device, directly via the software or with the help of a browser. Now, you can also get indicates about other team members who are also involved with the same set of diagrams. Synchronize faster and better with your team now. 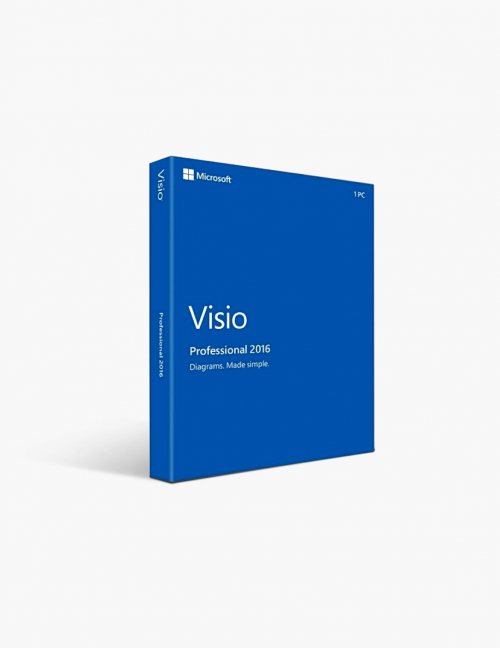 Why Buy the Microsoft Visio 2016 Professional? A Complete Makeover – Whether you are new to Visio or have used it before, with the 2016 Professional edition, Microsoft has completely revamped the productivity application in both visual and functional ways. With new themes, layout and features such as Information Right Management (IRM), one-step connectivity and minute detailing, the VISIO 2016 is better than before. Intelligent Interface – You get a host of exciting interface advantages with the Visio 2016 Professional edition such as – replaceable shapes (without deleting any component), spellcheck option, resizable symbols, junction jog, multiple page diagrams, different colours and themes amongst others. Visio 2016 comes in an all-new intelligent interface which itself is one of the main reasons to upgrade to this edition. Safe and Secure – Be it your personal or professional information, privacy is a must. With the Visio 2016 Professional edition, you get access to state-of-the-art security features like password protection and information management to better connect and share your diagrams with other professionals. Now your information is safer than ever and you can easily observe and track the changes made to it. Purchased full professional version for half the price and was able to download in a matter of minutes. Very happy. $234.00 | In Stock Want it Now? Order and receive your download instantly.